For most people, fundamentalism in the modern world has become synonymous with a radical form of Islam, but fundamentalism in many shapes and forms is also very much present in Western societies. Yes, fundamentalist economic, political, nationalistic, and religious movements are aplenty in the West. Using the lens of cultural anthropology, Gerald A. Arbuckle examines fundamentalist attitudes and movements in this book, exploring why they arise and how readers can constructively respond to them. Gerald A. Arbuckle, SM, is codirector of Refounding and Pastoral Development, a research ministry, in Sydney, Australia. An award-winning author, he is internationally known for his expertise in helping church leaders minister effectively in a postmodern world. In 2011 he presented the Martin D'Arcy, SJ, Lectures at Oxford University. His many books include Healthcare Ministry; Violence, Society, and the Church; Laughing with God; Culture, Inculturation, and Theologians; and Catholic Identity or Identities?, all from Liturgical Press. "This timely book is the work of a theologian and anthropologist who brings decades of experience and reflection to bear on a problem that is tearing apart both the Christian church and the entire world. Gerald Arbuckle traces the origins of fundamentalism to cultural trauma and the dangerous quest for certainty, and he provides a helpful survey of various contemporary fundamentalisms in both church and society. In addition, he proposes sixteen practical pastoral responses to this phenomenon that might help reconcile Christians among themselves and people of all faiths and political persuasions." "This challenging read draws on the wisdom of Pope Francis and called for a renewed spirit of listening and dialogue. I recommend this book to all, especially those curious about the impact of fundamentalism on our lives." "In this short but carefully argued book, veteran cultural anthropologist Gerald Arbuckle tackles one of the major sources of turmoil and violence in our world today–fundamentalism. Someone once remarked, `The opposite of faith is not doubt, but certitude.' Arbuckle not only describes the cultural contexts that generate destructive and deaf certitudes but also proposes many practical and pastoral responses to them." 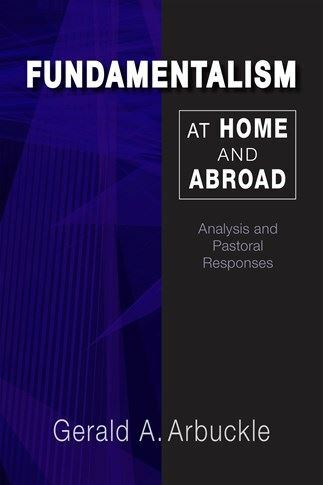 "Fundamentalism at Home and Abroad should be a great resource for courses in political theology, social ethics, and ecclesiology. It addresses complex questions without becoming complicated. For both theology classrooms and adult study groups, Fundamentalism offers a clear and engaging analysis of those forces and events that are shaping the political and religious climate of our time. It moves in the same direction that Pope Francis is guiding the hope and imagination of so many of us." "A masterpiece on an ultra-important topic. Its chapter on Catholic fundamentalism should be produced as a mass-distributed pamphlet for every parish. Fights the too-loosely-held notion that the opposite of faith is doubt, rather it is certitude."